A few weeks ago, I wrote about how you should always be editing, and I probably should have started at the beginning. As someone who is serious about photography, you should always be shooting. I don’t know if Malcolm Gladwell is correct when he writes about the 10,000 hour rule, but I do know that I didn’t get to where I am by not shooting. Luckily for all of us, Gladwell allows practice, performance, and even time spent thinking about your skill to count towards the 10,000 hours. You can’t always have the camera at your side, or up to your face – part of photography is missing things. That’s a very difficult lesson to learn as a photographer, our pursuit is dedicated to controlling and stopping time. I remember hearing a well known photographer that I respected say that “you miss photos all the time, and that’s part of photography” – it came as a real relief. We’re human, the pursuit should be rooted in pleasure and sometimes it’s good to just acknowledge that you saw the moment, framed it and captured it and stored it on your personal harddrive of neural networking. The writer is talking about the pleasure and posterity of photographs, and I agree, but I want to take it a step further and apply it to getting better at sports photography. In my post about editing, I talked about using failed pictures to learn what you are doing wrong in order to make better pictures. But what if you don’t have a camera with you? What if you have a long lens on, and a play comes directly at you or happens too quickly for you to focus on? It’s natural to curse yourself or your gear, and you should be hard on yourself if you miss because chances are no one else will. But you can still benefit from the experience if you burn it into your “personal harddrive” and use it on the next play or at the next game. What could you have done differently, how could you have used the players eyes or body language to predict the play, and how could you give yourself a better chance of success the next time? I have missed pictures three times in the last couple of weeks, and since I know some of you like to hear stories about professionals who screw up, I’m going to share. The first came at the end of the first week of Occupy Oakland, the Wall Street protest that is ongoing just a couple of blocks from my house. I had been shooting it all day for a week, as an exercise, and on Friday evening I was totally burned out and went to meet a friend for coffee not far from the protest site. I thought about taking a camera, but just wanted to relax and catch up, so I didn’t. Not 10 minutes later, we walked by a Muslim man leading a prayer, various Muslims and non-Muslims wrapped in a semi-circle around him, heads bowed. The early evening sun was bouncing off of a nearby mirrored building. I was cursing myself out loud for not bringing a camera, but rather than waste the opportunity by walking away, I stood there for a few minutes, imagining exactly what I would do if I did have a camera with me. Everything from the angles to the exposure, depth of field to framing. I don’t have anything to show for that – right now – but I do know that the next time I see something even remotely like that, I will be ready to make pictures from the moment I see what’s going on. Raiders punter Shane Lechler gets off a punt behind blocker Manase Tonga who has his helmet ripped off by Chiefs linebacker Demorrio Williams. My last example is the simplest example, because it involves a failed picture that I had the opportunity to correct in the same half of football. 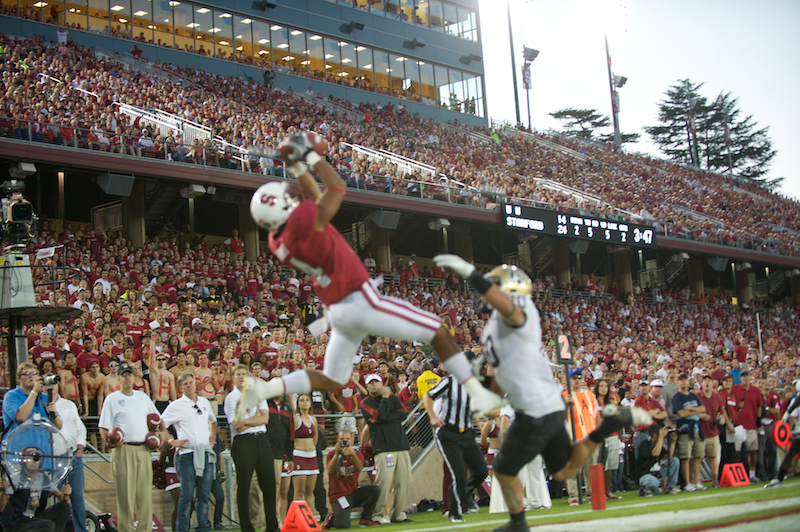 Here’s me trying to nail a leaping touchdown catch at the Stanford-Washington game on Saturday. I had my focus limiter set to full meaning that the 70-200 would focus from about 3 feet to infinity. This is necessary for when you think that a play is coming right at you, like on a run at the goal line with the anticipation of a celebration very close to your position. I guessed wrong, and the focus hunted even though I was right on the play. This is a very very bad miss, and I got very pissed at myself and wanted redemption. It doesn’t always happen like this, but in the very next quarter I was able to make amends, carefully tracking this play all the way into my lap. Literally, as the photographer sitting next to me bore the brunt of the impact and crashed into me. As I checked the screen, I saw that I had 7 pictures of this play, all in perfect focus, and I’m chalking it up to being extra careful because of the previous play and the jumping catch picture that only I could see. As a photographer, your mind and your eyes are the most important things that you have. You can become a better photographer by using them even if you don’t have a camera, or can’t get exactly what you want in your camera. Well, you asked for it so I’m putting my name on it. As a sports photographer, I make mistakes. 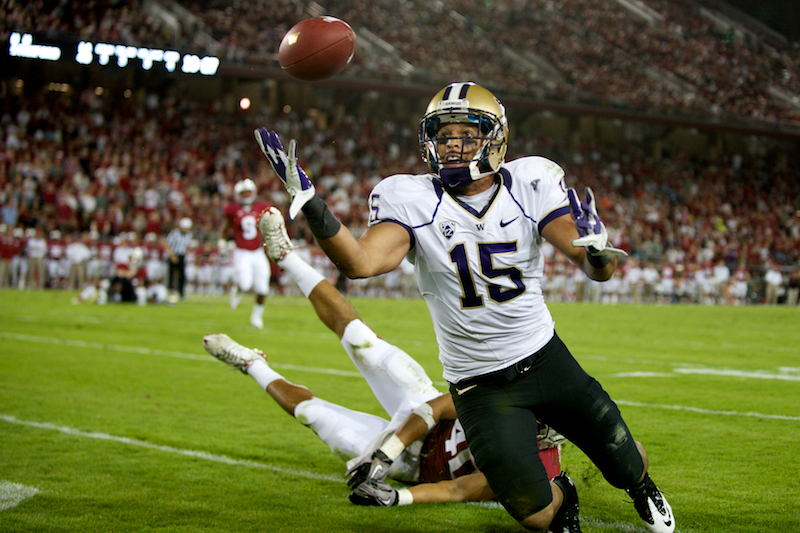 But as a professional sports photographer, I don’t make any mistakes. What I’m trying to say is that even if miss the goal, the winning shot, or the instant the game was one or lost, I will always get the celebration or vice versa. I think that is the difference between pros and amateurs. If you’re not doing this for a living, you are allowed to make mistakes. But if you are, you can’t make any. This says a lot about amateur sports photographers. You are free to make as many mistakes as you want as long as you are improving and not making the same mistakes over and over again. If you look at Training Ground images, some of the photographers are not making the same mistakes anymore which brings tears to my eyes. Maybe not, but I am very happy that some are learning from their mistakes. This also means that as an amateur you really should be taking more risks when shooting sports. Don’t be afraid and challenge yourself. You are the only person stopping you from taking good pictures. As my last 2 cents, I don’t take my cameras everywhere. I do sometimes, but I usually don’t. I now shoot almost exclusively when I’m working. Now, I don’t condone this behaviour. Of course I have LOTS of regrets for not having my camera like Matt did recently at Occupy (fill in the blanks). But c’est la vie. Life has to sometimes be experienced without a camera in your hand. I beat myself a lot more when I miss shots during the game than anything else. If it’s my fault, I sometimes can’t sleep because I’m so pissed off at myself. I start thinking that maybe I will never get another shot in my life. But this gets me going because I want to be the best out there. So, should you be shooting all the time? The answer is “Yes” if that is how you learn. In my case, as I have written in my previous post, it’s all in the planning. I plan my shots and if it doesn’t go according to it, I switch to plan B. Therefore taking pictures all the time will not make me any better, but knowing what to do when the moment arrives is more important to me. PS I’ve got approval from Matt to write this comment. No, I really did. Matt, on your missed focus shot, would you really have been adjusting the focus limiter throughout the action in that case? You say you have it set for the full range in case close plays happen, so would you really have had it switched to the limited mode in anticipation of the shot you missed? Doing that could have just as easily caused you to miss a close action play. Or do you usually try to have it at the limited setting and then switch it to full on the fly as the action approaches you where you need the full range? I like how Ryu is almost calling me an amateur in his post-size reply. Way to PUT YOUR NAME ON IT. Ben: I wouldn’t ever play with the limiter during a play. Before, based on my best guess and the odds that something could go to the worst possible spot for me. The hunting is what screwed me (my own fault) and if it had been limited before the play, I would have had a much better chance to get it. Me, I’m just an oddball. Just like… an odd person. Something like that. Ben: I agree here with Matt. Don’t change with the limiter during a play. Play with it when you have time to screw things up. Otherwise, leave it be. That’s what I figured. I know a lot of pros put tape over the switches on the lens so they don’t get changed accidentally. I don’t shoot football, so I wasn’t sure if you guys do things differently there. So the missed focus on account of the limiter switch was really more bad luck as it’s impossible to always correctly guess where a play will happen. Certainly experience can put the odds in your favor, but things like that are bound to happen from time to time I imagine. And you’re right about taking more risks as an amateur. I figured that out earlier this summer and started just “going for it” in terms of trying to get that risky diving infield play far more often instead of taking the safe route and watching the batter. It paid off by getting the photo that is the first one shown on my website’s front page. If you’re not getting paid to shoot something, there really isn’t anything to lose. So might as well get the shots other people can’t afford to risk.